F/S Philip Tweedy DFM - 635 Sqn Lancaster III ND819 F2-M Op. Duisburg T/o 2249, 21-22 May 1944 Downham Market - Crashed at Luyksgestel (Noord-Brabant, Holland) near the Dutch border 12 km SW of Valkenswaard. (Per W R Chorley: F/S Tweedy had served with 76 Squadron, details of his DFM having been published on 14 September 1943, he had flown with Norwegian, Lt E. Sandberg. The following on the aircraft were: Sgt E J Rowlands RAF (KIA),(he rests in Nederweert War Cemetery; F/S M B Rumbles RAF (KIA); F/S L J Making RAF (KIA); F/S A A Jepson RCAF (KIA),(these three buried at Eindhoven General Cemetery Holland); W/O G A D Mould (commemorated on panel 214 Runnymede Memorial). W/O J A Porter, RAF, initially evaded until captured 16 Jun 44 and interned in Camp L7, PoW No.278. W/O Kenneth C Sweatman RCAF - 424 Sqn Halifax III HX313 QB-B Op: Bourg-Leopold T/o 23.45 27-28 May 1944 from Skipton-on-Swale - crashed at Oostham-Langven (Limburg), 6 km WSW of Leopoldsburg, Belgium. Through Col. Neels we see that Kenneth Sweatman came from Kelliher, Saskatchewan Canada. Crash in Olmen-Germeer (near Balen) after the bombardment of mei 1944 of the Camp of Beverlo (Leopoldsburg) “cared for by Theunis Alfons (local resistance), during 1 night (medical care, food, bed…) Passed to Neels, (accompanied by De Groof Frans); transport to Balen, 7 days with Neels, and transport to Mrs Leemans-Geel. Crash and rescue documented in the book of Frans Smolders: “Olmen tijdens de 2de WO” and his book: “The last flight of the Blonde Bomber”; and in the study-project of the youngster Bram Dierckx “Terug naar de basis” = Back-to-base”: Escape-routes for allied airman to Britain”. F/L B L Mallett RCAF - 424 Sqn Halifax III HX313 QB-B Op: Bourg-Leopold T/o 2345 - see Sweatman above - same aircraft 27-28 May 1944 from Skipton-on-Swale - crashed at Oostham-Langven (Limburg), 6 km WSW of Leopoldsburg, Belgium. S/Sgt Roy O Martin - 34407637 USAAF (MACR 7388) Dorsal Gunner on B-17 aircraft 42-107225 from the 425 Bomber Group / 731 Bomber Squadron. T/o Deopham Green, Norfolk - aircraft lost on 9 August 1944. F/O Alfred Kenneth Baker RAF - - 619 Sqn Lancaster I LL784 PG-M Op: Aachen T/o 2043 Coningsby 11-12 April 1944 –(see Drake above) Both survivors were able to deploy their parachutes after being blown from the Lancaster as it exploded. Those killed were buried 14Apr44 at Eindhoven (Woensel) General Cemetery. S/L McGilvray an Edinburgh University Graduate had gained a Half-Blue for boxing. 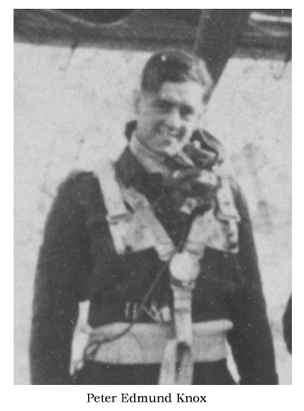 W/O Munro had flown his first tour with 617 Sqn, details of his DFM being gazetted 11 Jun 43. S/L J.W.E.D.McGilvray DFC (KIA); Sgt I.R.F.Haberfield (KIA); F/O E.A.Drake (evd & PoW); F/O A.K.Baker (Inj); P/O J.L.Pritchard (KIA); Sgt R.Hillier (KIA); W/O A.A.Munro DFM (KIA). F/O A.K.Baker was confined to Hospital NK due to injuries, no PoW No. issued. F/O E.A.Drake initially evaded until captured in Brussels 19Apr44. Held captive in St.Gilles before internment in Camp L3, No PoW No. F/S Arthur M. Rae – RAF 76 Sqn Halifax III MZ623 MP-P Op. Aachen T/o 2241 24-25 May 1944 from Holme-on-Spalding Moor. Cause of loss not established. Crashed at Arendonk (Antwerpen), 9 km E of Turnhout. Countries. Also on aircraft: W/O F. Bishop (PoW); Sgt W.T. Mays (PoW); F/O T.H. Greer (Inj); F/S W. Cliff (PoW); Sgt J. Danes (PoW);Sgt C. Cassidy (PoW). W/O F. Bishop was interned in Camp L7. PoW No.4, with Sgt C. Cassidy PoW No.9, F/S W. Cliff, PoW No.11, Sgt W.T. Mays, PoW No.37 and Sgt J. Danes PoW No.15. F/O T.H. Greer was confined in Hospital due injuries. No PoW Number. After the war Albert Cools went to Africa (Belgian Congo), he died long ago; His brother Jef (Jozef) Cools became a policeman, later adjunct-commissioner in Balen. The Balen Resistance Group helped many others but these are the names immediately available.